Amsterdam trams headed down the Damrack.Eleven of Amsterdam's 16 tram (trolley) lines begin and end at Centraal Station (seen in the background of the picture to the left). 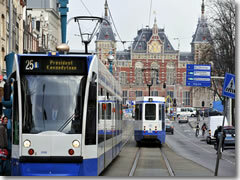 Other main tram connection points are Dam Square, Muntplein, and Museumplein. For transportation information, call tel. 0900/8011 or use www.gvb.nl. Frankly, the easiest thing to do is to get an unlimited ride I Amsterdam City Card (which also covers most major museum and sight admissions, plus a canal cruise) and forget about having to buy individual tickets. Not only will this save you time and money in the long run (assuming you're here to do sightseeing), but it will save on the headaches. Here's why. In 2011, Amsterdam introduced the OV-chipcards for all public transportation needs, retiring the old paper tickets, which were gloriously complicated to use and—considering the fame of the local Red Light District—came with the unintentionally funny name of strippenkaart. Buy a "disposable" OV-chipkaart on board the tram or bus for each ride—a single, one-hour ticket costs a steep €2.60. You can transfer as often as you'd like within the one hour. There is also a 24-hour disposable pass for €7 (48 hrs is €11.50, 72 hrs is €19.50). Buy a multiple-ride "Anonymous" OV-chipkaart for a one-time €7.50 (good for five years) from the GVB ticketing office (there's one across the Centraal Station, another in the Centraal Station Metro stop) or from an automated machine (at major stops and Metro stations), then add value to its "E-purse." This works like debit card, but you really have to have a sense of how much you are going to use, and that's the bit where it gets tricky. Each ride costs an initial €0.79 plus €0.105 per kilometer (if you transfer within 35 minutes, a second ride doesn't incur the €0.79 fee). So it helps to know ahead of time how much a typical ride will be, since you have to pay ahead of time. If all else fails, keep in mind that Amsterdam, with all its canals, is a city made for walking. There is also a bus system that ranges a bit farther afield than the trams (though few are in the historic center where most tourists spend the bulk of their time) but otherwise works exactly the same way. The Metro (subway) system of Amsterdam is really designed for residents and commuters, and mostly crosses the southern, residential reaches of the city. The only really useful Metro line for tourists is Line 2, which starts at Centraal Station and heads south, stopping at Nieuwmarkt, Waterlooplein, and Wessperplein before heading beyond the center. Get the pass: The I Amsterdam Card City Pass gets you unlimited rides on all public transportation (except the airport train), plus free admission to most major attractions, a canal cruise, and more. How to get on the tram or bus: Best bet: always get on at the front. Some trams have conductors at the back, but some do not (nor do buses), so just stick with the front and deal with the driver. I you need to buy a disposable card (and didn't use an automated machine), do so now. If you have an anonymous OV-chipkaart, scan it at the yellow card reader (pictured to the right) when you board and then again when you get off. How to get of the tram: Sounds silly, but I've often seen tourists stymied trying to disembark from a tram, then panic as they pull away from their intended stop and are still trapped inside. Know this: The doors on Dutch trams and buses do not open automatically; you have to punch the deur open button. Don't froget to scan your OV-chipkaart ticket again. The night bus: Between 12:30am and 6am, the only public transport running is a system of night buses. The fare is €4. Leave the bike at home: You can only take a bike onto the relatively useless #26 tram (and the Metro), and it'll cost you an extra €1.50.